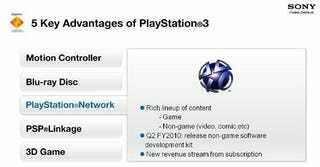 Outlined today during a Sony presentation to investors and analysts, the PlayStation Network has 33 million registered accounts, 5.4 million daily user sign-ins and 1.4 million daily visits to the PlayStation Store. Those 33 million users download a staggering 25 petabytes of data a month. More importantly for Sony, they're also spending three times what they did last year at the PlayStation Store. Sony's presentation highlights what it called a significant revenue in downloadable games and add-ons. The company also pointed out that its video delivery service now has more than 2,417 movies and 15,047 television episodes. A final point made in the slide presentation by Sony about the PlayStation Network is that a new revenue stream is coming from a subscription model. Reached for contact this morning, SCEA told Kotaku that in terms of the PlayStation Network and subscriptions "we're looking into a variety of options, but nothing to announce at this time."